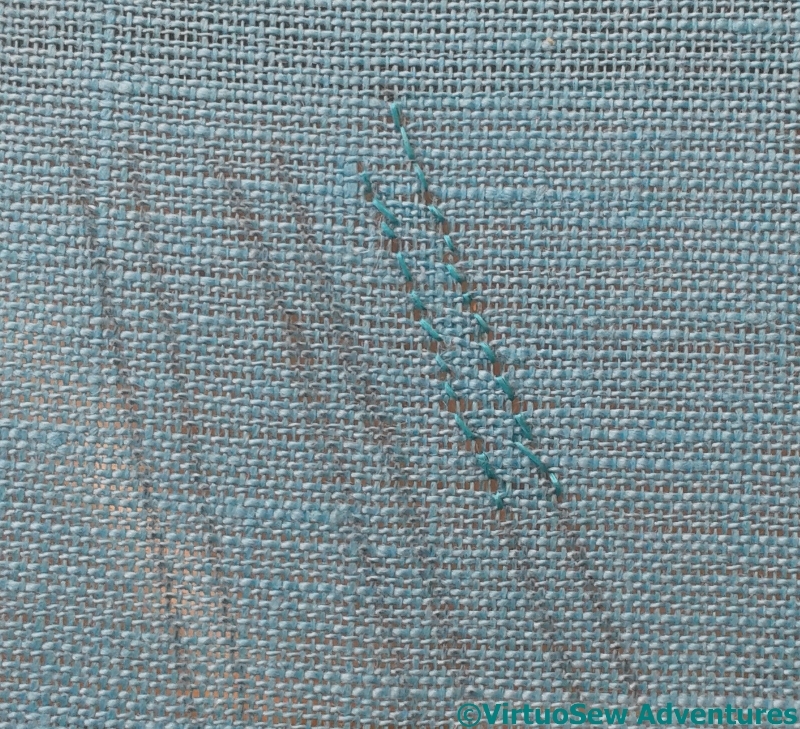 It does look much better with the reverse chain stitch. It’s a lovely color too. 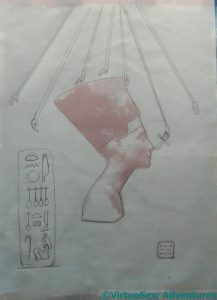 I love the blessing hands added to your piece along with the Ankh, the reverse chain works nicely. … she would be so proud of you! Yes, there are a lot of things we can do now that we, or others, did not think we would be able to when we were young. I’m unfamiliar with this artwork and learn a lot. Keep ump the good work. I love your idea for using morse code for your imitials. There are pieces where using letters doesn’t work. This is a great solution. I like preparing and twisting my own threads. It’s a useful little pause in the stitching process, a chance to think about what I’ll be doing with the thread I’m making and the logistics of the next stage. 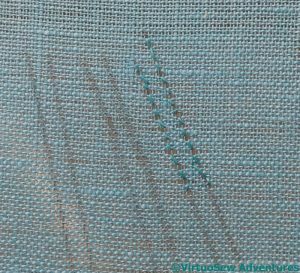 The shadow stitch is lovely, but a little too understated to go with the bolder head. The reverse chain looks a better option for the piece as a whole. I do hope your handiwork will encourage the Aten to come out a bit more and stop hiding behind the rain clouds! So much thought is going into this piece. And it is paying off! I’m not sure fifteen year old me would have understood most of this post, but would probably have been impressed by such things! I love the way this is developing! this looks most interesting. 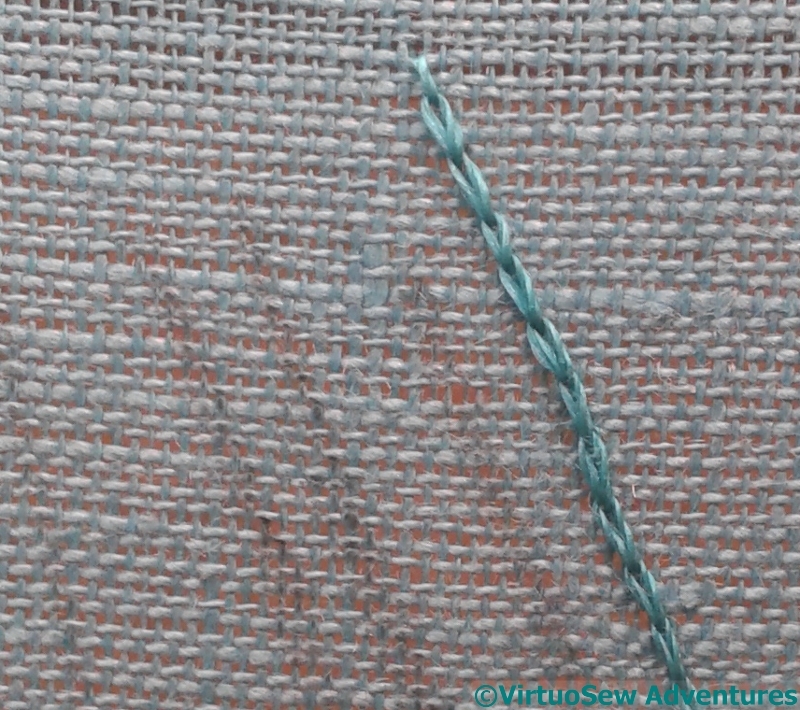 I like the reverse chain stitch very much. 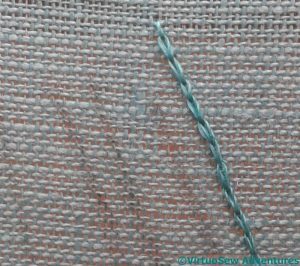 Isn’t in interesting how some stitches should work in theory but then just don’t once they are stitched on an actual piece. After you’ve finish the piece you should do a write up (perhaps a summary of your blog posts) so that in the future others will know the thought and research that went into the making of it. if Grandma could see you now she would be proud….your work is consistently beautiful. I like the details about your process that you always share. I’ve never tried twisting my own thread, and haven’t used a lot of silk the last couple of years. I may give that a go after my current project, though. The design here is wonderful. I might have thought of the rays, but never the little hands and objects at the ends!